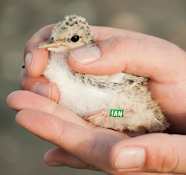 Kilcoole Little Tern Conservation Project: New Recruit! Just a quick post to say our first chick of the year hatched today! K2 was the first nest which we expected to hatch and it didn't disappoint. The second egg in the nest had a well defined hole in the shell, poked from the inside out so hopefully today's chick will have a sibling by tomorrow. A couple of other nests are showing early signs of hatching too. Then a large batch of nests are due to hatch from mid-week onwards so it will be all go for the wardens. We're currently in the midst of a run of high Spring Tides but thankfully the winds are from the West for the next few days so fingers crossed we will get through them with no trouble. So good to hear this - lets hope the weather will be kind to them and the hedge hogs stay away!